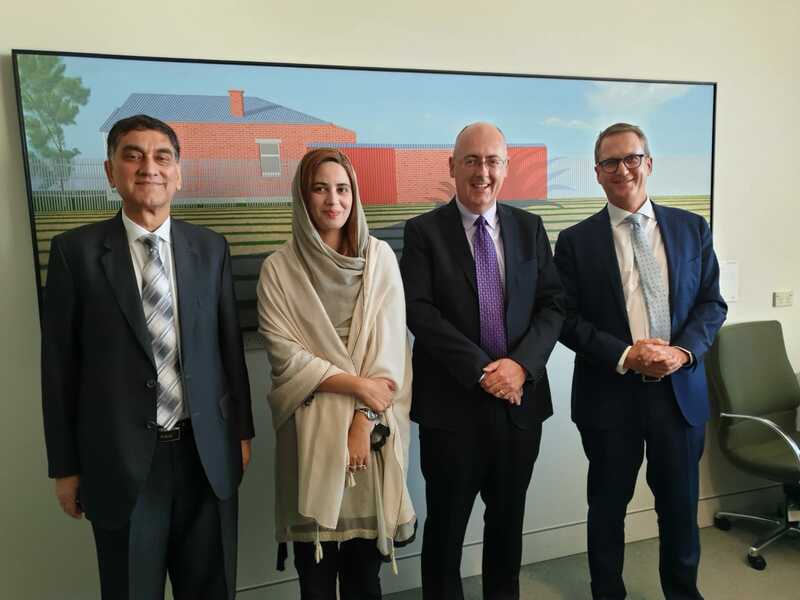 The Minister of State for Climate Change, Ms. Zartaj Gul visited Canberra from 8-10 April 2019 on the invitation of the Government of Australia. She held meetings at the Department of Foreign Affairs and Trade (DFAT), Department of Agriculture and Water Resources, Commonwealth Scientific and Industrial Research Organisation (CSIRO), Australian Renewable Energy Agency and with the officials of the ACT Government. She also met Mr. Ewen McDonald, Head of the Office of Pacific and former Developed Country Co-Chair of the Green Climate Fund and the Ambassador for Environment, Mr. Patrick Suckling. The Minister also visited the Australian National University. Ms Zartaj Gul also led the Pakistani side at the roundtable discussion on climate change, environment, renewable energy, agriculture and water resources. She stated that several projects like the ‘billion tree Tsunami’ were initiated during the PTI’s Government in Khyber Pakhtunkhwa. The Minister underscored that keeping in view the challenges posed nationally, regionally and globally by climatic changes, the current Government had taken several pioneering measures like ‘Clean and Green Pakistan’ and the country-wide ‘Billion Tree Tsunami Initiative’. Ms Gul stated that Pakistan presented huge potential for joint ventures in climate adaptation and mitigation technologies. She hoped that the two countries would benefit through institutional cooperation and joint research in climate change, agriculture, ocean and marine environment.